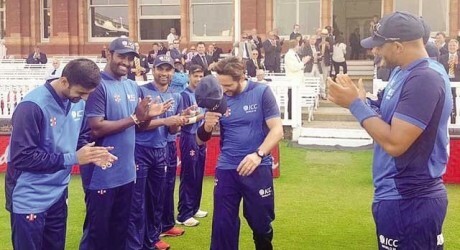 London, When our board members of PCB refused to give guard honour to the great player, Shahid Afridi then the players of the World XI gave the tremendous guard of honor to Shahid Afridi. 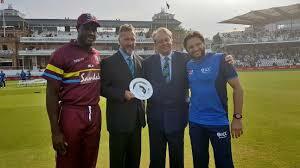 The charity match was being played between the teams of World XI and West Indies at Lords in which Shahid Afridi was the captain of the World XI aiming at the restoration of the cricket venues destroyed by the ocean thunderstorms in the West Indian islands. PCB disgraced the great player of Shahid Afridi to get retirement from the international cricket and he was deprived off the farewell match but the players of other countries saw him off from the international cricket. When the Pakistani all rounder entered in the ground to play the last international match, then the players of the World XI gave him the guard of honor. Due to injury in the knee, Shahid Afridi was limping and he did his batting and bowling with great difficulty. He got one wicket and also made 11 runs. On his bravery, the cricket fans gave him tremendous applauds. Shahid Afridi said that he is lucky that he was going to play the last match of his career in the home of cricket and he paid thank to Andy Flower and the English Cricket Board. He said that he was way from cricket because of knee injury and it seeded very strange for him to hold the bat again and bowl but he did it for a big and noble cause. After that he gave a message on the social media website and thanked ICC to give the close of his international cricket in home of cricket. He also made the announcement for donation of $20,000 from his organization to the affected people of the Caribbean islands. In this charity match, West Indies beat World XI by 72 runs. The winner team scored 199 runs in the allotted overs for the loss of 4 wickets in which Evan Louis made 58 runs, Danesh Ramdin made 44 runs and Marlyn Samuels made 43 runs. When World XI started its batting, its four players were out at mere 8 runs and the players were included Tamim Iqbal, Luke Ronchi, Danesh Karthik and Sam Billings. The World XI could not manage to control the damage after losing the four quick wickets. Thisara Parera scored 61 runs but they could not save the team from defeat. When Shahid Afridi was asked to come back in the international cricket, he refused it in a joke that he is injured and he could not play more with this injury and doctors have suggested him to take regular rest. When he was asked to lead the World XI, he could not refuse to accept this offer.